A place situated at the northern limit of Palestine, in the valley of Lebanon, near Mount Hermon (Josh. xi. 17, xii. 7, xiii. 5). Since I Chron. v. 23 mentions Baal-hermon as the northern limit of the tribe of Manasseh, it has been supposed that Baal-gad and Baal-hermon are identical. This conjecture is quite possible, and more plausible than that of Gesenius, Raumer, Robinson, and others, according to whom Baal-gad (Hermon) is identical with the later celebrated Paneas (Bâniâs); for Paneas can hardly be said to lie in the valley of Lebanon. 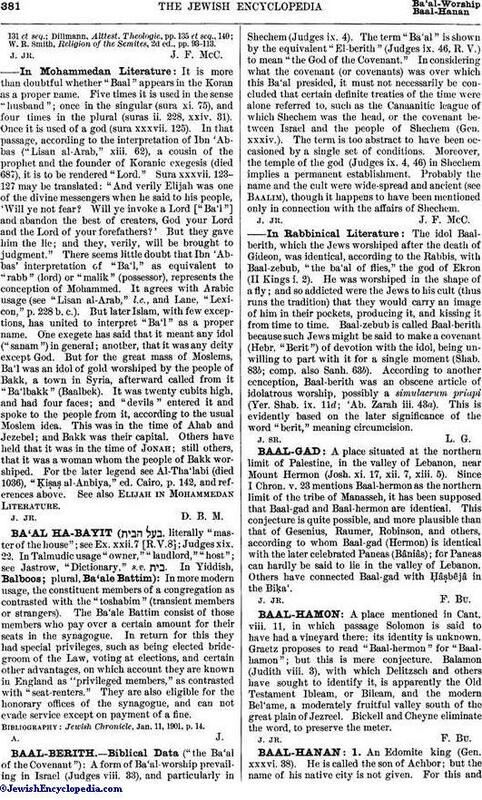 Others have connected Baal-gad with Ḥâṣbêjâ in the Biḳa'.